This page is unavailable on mobile devices. Imagine you have a normal spreadsheet in Google Drive that you and a few friends are working on together. How does everybody’s copy of the spreadsheet stay up-to-date? Each change is sent to Google and Google sends each change to everybody. When you make a change to a spreadsheet that is on Google Drive, that change is sent from your computer to Google, and then from Google to all of the other people who are working on that spreadsheet. Imagine you have a magic spreadsheet that you and a few friends are working on together. This magic spreadsheet is stored as a file on each of your computers. Imagine you have a magic spreadsheet that you and a few friends are working on together. This magic spreadsheet is stored as a file on each of your computers.When you make a change to this magic spreadsheet, that change is sent from your computer to everybody else’s who also has a copy of this spreadsheet. There is no central authority like Google that the changes are sent to/from; all changes are sent directly from one computer to the other computers. Therefore, the computers are constantly listening and sharing new information with each other. Imagine the magic spreadsheet has two columns, name and balance. The balance refers to the amount of Bitcoin held by the name in the same row. 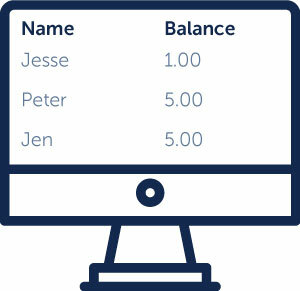 With Bitcoin, the only change you are allowed to make to these spreadsheets is to subtract some amount from your balance and add that subtracted amount to somebody else’s balance. When you make a change to this bitcoin spreadsheet, that change is sent from your computer to all other computers that have a copy of this spreadsheet - just like the magic spreadsheet! Validation refers to checking that the sender’s balance is greater than or equal to the amount of Bitcoin he is attempting to send. Each computer receiving the change will “validate” the amount of Bitcoin transferred by the sender. If the change does not pass validation, then the change is not saved in that computer’s copy of the spreadsheet. Validation fails when Jesse attempts to send 2.00 Bitcoin to Peter, but Jesse only has 1.00 Bitcoin. This change is not saved because validation fails. Validation succeeds when Jesse attempts to send 1.00 Bitcoin to Peter. Jesse’s balance will decrease by 1.00 Bitcoin and Peter’s balance will increase by 1.00 Bitcoin. Everything adds up! The change is saved because validation succeeds! You understand how Bitcoin works! ‍Of course there are many important details that we skipped! If you want to learn more, consider signing up for one of our courses or reading more articles from this living list of resources! We facilitate great conversations between Blockchain enterprises, students and academics to further the knowledge of Blockchain in the Penn community.